The Crows beat Brisbane with the highest score of the season, the Lions’ second biggest defeat ever and Adelaide’s equal-second highest winning margin. So here are a few things that annoyed Tom Richardson. Somewhere in this scrum there is a ruckman who has just kicked his first AFL goal. Photo: Michael Errey, InDaily. As Port stretched well into the second term at the SCG without registering so much as a behind against the rampant Swans, it occurred to me that this was bad news for a whole bunch of teams. It was bad news, technically, for the Crows – along with every other team mired between second and fifth spot and relying on percentage to determine how high they climb – or how low they fall. It was an odd mix of schadenfreude and dawning horror, this match: like watching someone you don’t like fall into a lake and suddenly realising that they’re holding your wallet. It was bad, of course, for the Power. Oh, was it ever bad. This was supposed to be the game that cast them as finals gate-crashers and yet, with everything to play for, they appeared as clueless about the match at hand as most of the Sydneysiders who’d turned up to cheer on the Suns… or whatever their local team calls itself? But there was one team for whom the Power’s inept capitulation was really bad news. And that was Brisbane. After all, the Lions had just come off a 94-point home-ground shellacking at the hands of Port. Who, it was suddenly apparent, are not really very good. Which prompted the question: how will they go playing an away game against a team that is potentially quite competent? Fortunately, we didn’t have to wait long to find out. Daniel Talia repelling a Lions’ forward foray. Photo: Michael Errey, InDaily. It was suggested on Twitter after Saturday night’s Lion cull that it would be hard, even for me, to put a negative spin on the weekend’s footy. Which sounded an awful lot like a gauntlet being thrown down. So I will give it my best. The fact that even while getting soundly spanked, Port still found a way to screw us over. In fact, it’s entirely possible the whole thing was done on purpose to boost Sydney’s percentage at our expense. Watching this game was a bit like eating deep-fried ice cream: I know it’s really bad for me – like, potentially fatally bad – but I still enjoyed it immensely. Given we had 24 scoring shots to five at half-time, it would be fair to assume that the visitors were under some degree of pressure. But did this pressure translate into a single shanked shot on goal? Of course not. Their five goals straight at the half, bizarrely, flattered them (if it’s actually technically possible for a team trailing by more than ten goals to be flattered). The one from a loose-running Daniel Rich was particularly vexing, since it implied we were evidently tanking. Fortunately, they only managed one further goal for the entire remainder of the match, while we added 13. So I will concede this is a relatively minor quibble. The fact that we just fell short of avenging that hideous 2004 drubbing by Brisbane, in which we capitulated to the tune of 141 points. Sure, we reached a few other milestones. When Jenkins put the ball through the big sticks from his traditional vantage point of point blank range in the final term, we hit the psychologically-pleasing margin of 119 points. But I was left transfixed as I waited for Brodie Smith’s final shot to fall agonizingly short – a result symptomatic of a night that saw the running defender rack up 25 touches at 52 per cent efficiency with six clangers thrown in for good measure. Finally, it seemed we could symbolically erase one of the biggest trainwreck memories of my football-watching career. Our win on Saturday was a consistent build: seven goals in each of the first two quarters, eight in the third, five in the last. We ground Brisbane down, and went on our merry way. Cam Ellis-Yolmen kicked two goals in his first senior game for the season. Photo: Michael Errey, InDaily. The loss to the Lions at the Gabba 12 years ago was very different. Lest we forget, we were only 31 points down at half-time. Ludicrously in hindsight, I spent the long break ruing a sprayed sitter from Luke Jericho that I was confident would have put us right within striking distance. And then – and I still cringe as I write this now – Brisbane came out and kicked 21 goals to two in the second half. Justin Leppitsch, by way of consolation, only had three touches, but to be fair the ball probably wasn’t down his end of the ground a whole lot. Justin Leppitsch. Has had better days. Photo: Michael Errey, InDaily. Up until that point I’d always had a soft spot for Brisbane. Having lived there for five years as a kid and spending time in Fitzroy as an adult, I kind of felt justified in calling the Lions my second team. But Round 17, 2004 put an end to all that! We did at least manage to come home and win the following week, and it would be handy if Brisbane could do the same in a fortnight, as they’re playing Geelong. However, despite not (quite) eclipsing our worst losing margin, we did match our 138 point win over the Bombers from 2006 that I alluded to last week – so it’s good they were evidently paying attention. Anyway. It could be argued there’s little enjoyment to be had in humiliating the competition’s basket case. But anyone who argues that is, frankly, an idiot. 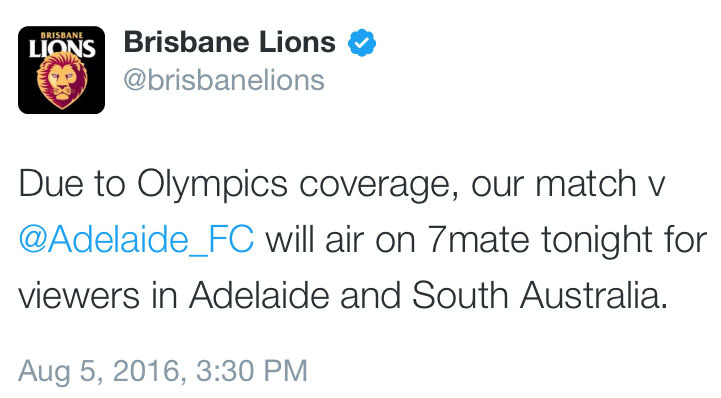 Brisbane’s campaign was derailed even before the round kicked off, with their social media account tweeting on the Friday that due to Channel 7’s Olympic coverage, the match would be broadcast instead on 7Mate – that evening. Which was either an amusing case of a “timed tweet” going awry, or they had a cunning plan to play the game a full day early in order to catch us on the hop. In which case, I suspect they still would have found a way to lose. Of course, we shouldn’t blame Brisbane’s social media guy; he only tweets like that because he works in a basement with no windows. @brisbanelions don't start without us! Yep, if Tom Rockliff thought choosing the aftermath of a thrashing to a non-finalist to bemoan the state of his team’s training facilities – in particular the fact that the gym has no sunlight – we should be less concerned about the coach and more concerned with the PR manager. Remember when Jared Polec et al walked out on the club, only to be labeled “mummy’s boys” by Irish-born defender Pearce Hanley? Well, clearly Rockliff is no Mummy’s boy. He just doesn’t like training in the dark. It does, though, explain the Lions’ malaise: they train for hours on end in a room with no natural light, and are then expected to perform well in stadia that are full of the stuff. It’s no wonder they get confused. Rory Sloane typically making light work of heavy traffic. Photo: Michael Errey, InDaily. Anyhoo, painting themselves not merely as serial losers but whingers to boot seemed a strange gambit, and probably won’t win them many new fans, but to be fair they probably couldn’t have gone down much further in most people’s estimations anyway. But talking of whingers, and just to prove I can occasionally look on the upside, here’s a couple more things I actually liked on the weekend. Melbourne did the competition a huge favour knocking off Hawthorn. Now, if they can manage to do the same thing to Port and/or Geelong in the coming weeks, I might make them my new second favourite team. Richmond would have done the competition a huge favour knocking off Collingwood, if either of them were even slightly relevant to proceedings. But it was a heartening victory for Tigers fans, who can now be kept guessing for yet another week. After their inept display against GWS the previous week, forward Jack Riewoldt dubbed the effort “unRichmond-like”, with no apparent trace of irony. It was, in fact, the archetypal Richmond performance, but so too was the fact they were able to bamboozle everyone with an impressive win the following week. When the Pies bounced out of the blocks, kicking the first four goals to none, Damien Hardwick must have considered resorting to his traditional tactic of asking the AFL to call off the game. But luckily, either he didn’t or they said no, and the Tigers rallied to put the weekly Victorian media blowtorch back on Nathan Buckley. Which is something that will get no complaints from me.